A few days ago, I bought my first e-book, crossing over to the dark side of bookdom. At first I felt guilty about it, but now, I must say, I have enjoyed visiting parts of the dark side. Nevertheless, I don’t plan to live there (at least not yet). Let me explain. I am a book person. I own several thousand. I have lugged tons of books from coast to coast to coast. Moving from Berkeley to Durham N.C., I took a couple thousand pounds of books with me. Changing Durham for Athens, Georgia, I hauled a couple of large vanloads to the new location. More recently, relocating from Athens to Birch Bay, Washington, I packed a huge u-haul van full of them (who needs furniture?) and drove them here. It gets even worse: a couple of years ago, I bought more than 11,000 books through an EBay auction and moved them from Seattle to Birch Bay. Thanks to that purchase, until recently I had two storage units full of books in addition to a house jam packed with them. I not only read and collect books, I sell them on Amazon. At present, I have a couple thousand books listed and several hundred waiting patiently to join them. Given this context, it should be understandable why, as a buyer and seller of real books, buying an e-book seemed like crossing to the dark side, joining the forces of evil that intend to entice everyone to read books from a screen rather than from paper. I feared my treasonous behavior would contribute to the demise of real books that have long been a part of my life. Now, a few days later, my guilt is gone. I have figured out that it makes sense -- and does not betray bookdom -- to own two types of e-books: free out-of-copyright books and expensive bestsellers. However, I also have concluded that if I start purchasing digital versions of my favorite type of book, “serious non-fiction,” I will have truly joined the deepest levels of the dark side of bookdom, instead of just visiting it for my own amusement. Before I purchased my first e-book a couple of weeks ago, I had long been the proud owner of the digital version of several old books whose copyright expired long ago. These rare, almost impossible to find, books relate to some of my research interests. For example, I downloaded from Google several books by Friedrich Gerstaecker that were published in Germany in the 1840s and 1850s, describing his travels in the United States, including long visits in Arkansas. Also, I added to my free digital collection several books written during the last part of the 1800s about the experiences of Germans in the American Civil War. All of these books are accessible only in a few U.S. libraries. If they are available for purchase, they are very expensive. Yet now I have them in digital form at no cost. 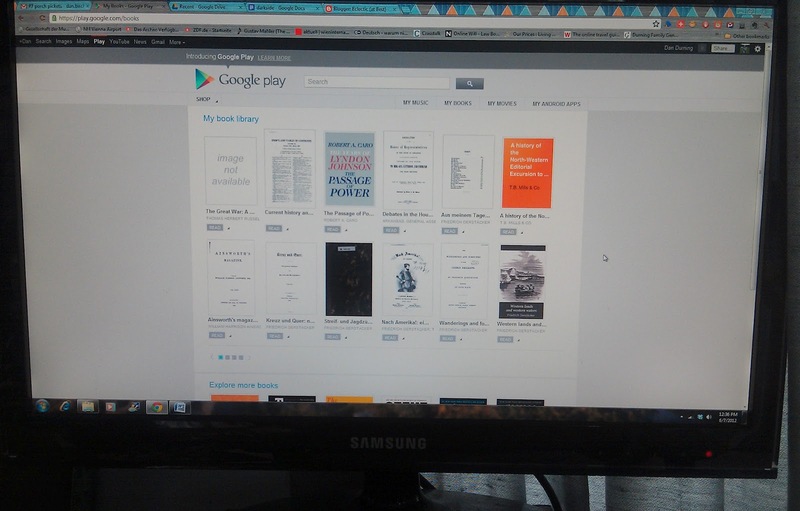 My positive experience with these free books on Google Read (Play Read) showed that it is possible to enjoy reading books on a tablet, computer, and cell phone, though I found that reading from a screen is somewhat less enjoyable than reading real copies of a book. 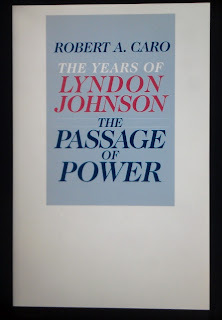 So, when I was preparing to buy a copy of Robert Caro’s long-awaited The Years of Lyndon Johnson: The Passage to Power, I considered the reasons while I should buy a real copy of the book instead of a digital copy. While I slightly prefer reading a real copy, price considerations favored the digital copy. 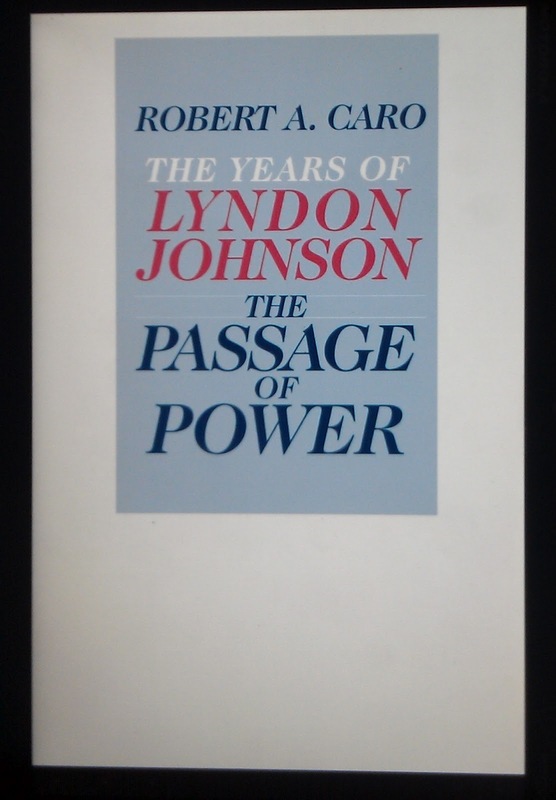 The Caro e-book cost $16.26 with tax, less than half the hardcover list price, $35.00, plus tax. The e-book price was also a few dollars less than the lowest on-line discounted price of the new book, especially when postage costs were included in the calculation. A couple of other convenience factors also favored the digital version of the book. Firstly, I could download it in seconds, avoiding a drive to the nearest bookstore or a wait for the book to arrive in the mail. Secondly, I planned to take this thick book, which has over 700 pages, with me on a trip that would include a couple of flights. The idea of adding a few pounds to my carry-on bag was not enticing. With cost and convenience as pluses, and reading experience as a slight negative, the next consideration was my preference that e-books not take over the world. As I have said, I like real books -- to read and sell -- and want them to thrive. 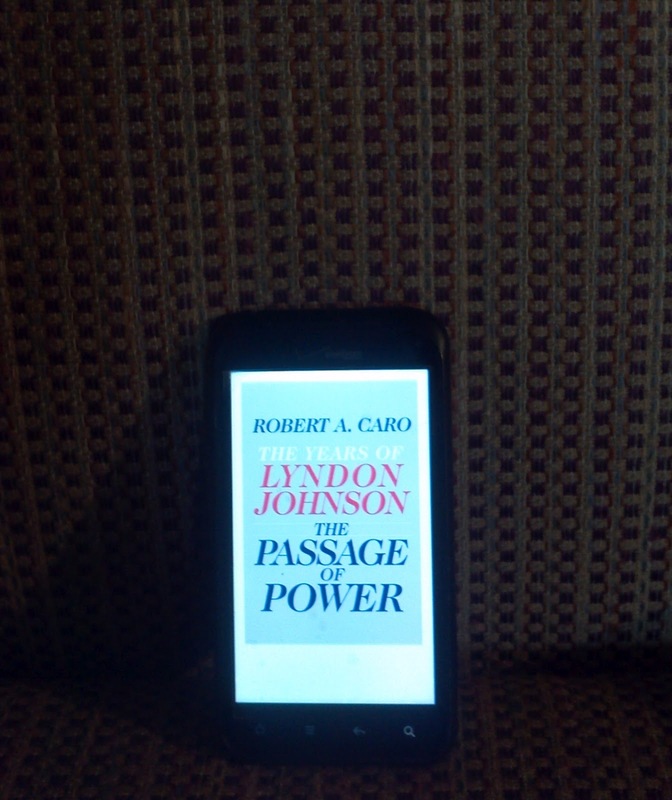 Would my purchase of an e-book contribute to the demise of real books? Maybe it would, I concluded, but that might not be a bad thing for popular best sellers like Caro’s. Do we really need to cut down forests to publish hundreds of thousands of copies of the latest morsels from Patterson, Clancy, Steel and the like? Face it: their latest books are gobbled up by excited readers, then discarded like day-old newspapers. Within a few months of their publication, used copies of almost all bestsellers can be purchased on-line for a penny, indicating the large surplus of supply over demand. While I can justify purchasing a bestseller as an e-book, I still reject the idea of buying “serious non-fiction books” in digital form. These books are not bestsellers. They are published in small numbers to sell to libraries, researchers, and other specialized groups they interest. If you go to the non-fiction section of a public or academic library, you will find shelves stuffed with them. This category of books makes up most of the books I own and sell. I want them to continue to fill the bookshelves of homes and libraries throughout the world. Fortunately, this type of book will continue to be sold mainly as real books, at least in the short-term future. Most of them, especially those published more than a couple of years ago, are not available in digital versions. (Google could change that when the legal fight over its book copying project is settled.) And when one of these books is available as an e-book, its e-book price is usually about the same as the price of a new hard copy of the book and is higher than the cheapest used copies. The high prices of the digital version of a “serious non-fiction” book reflects the concern of publishers that selling it at a discount would reduce the number of hard copies it would sell at full price, thus lowering the total revenue produced by the book. The assumption is that the book has a limited, fixed set of potential buyers so that a lower e-book price, instead of increasing the number of books sold, would result in people substituting the purchase of the e-book for the purchase of a higher-priced real copy of the book. Fortunately for me, the pricing of e-book vs. real book versions of “serious nonfiction” supports my preference to minimize the sale of this type of book in digital form. Given the choice of paying, say, $40 for an e-book or $40 for a new hard copy of the same book, most people will choose to purchase the hard copy. If the book relates to a research interest, the book purchaser will likely want it accessible on his or her shelves for an extended time. Typically, the book is bought not only to read, but also to be part of a personal or public library. A more difficult test of my commitment to the continued dominance of “serious nonfiction” in real book format will come if publishers (or some company such as Google) start selling this type of book, a couple of years after it is published, in a digital format at a lower price than new hard copies and perhaps even cheaper than used copies. If that happens, will I be willing to pay a premium for a hard copy of a “serious nonfiction” book I want, enjoying a preferred reading experience but giving up the convenience of downloading and porting a digital copy? I expect that the prices of older "serious nonfiction" e-books will fall in coming years, and I like to think that I will make a stand against bookdom's dark side by continuing to purchase hard copies of these books. Then I remember that a few years ago I got great pleasure each morning from holding in my hands a newspaper with fresh ink, devouring the latest news. I enjoyed the feel of the paper, the familiar look of the layout, the ability to clip articles related to my interests. I enjoyed seeing the older copies in a pile ready for recycling. But I gave up all that for the convenience, immediacy, vast selection, and lower cost of news available on the internet. And I would not want to go back to the days when I got my daily news mainly from a newspaper and the evening network newscast. So, realistically, if I could be bought by lower prices and convenience to change how I get news every day, I am likely to trade my preference for real "serious nonfiction" books when offered these books in digital form at prices lower than hard copies. Sadly, it appears I am inching toward a life on the dark side of bookdom where I will be purchasing most of my books in digital form. However, when I'm there, I promise to still visit garage sales and thrift stores to add real books to my growing ever-growing ibrary.